with a summary in English: Art on Late Palaiologan Crete. The study of the architecture and the frescoes of the St Antonios church in the Brontisi monastery – a prime example of Late Palaiologan art on Crete – has remained fragmentary for a long time. An examination in the present book has revealed that the architecture, consisting of two naves and a bell tower attached to the western front, was built in at least two periods. Written sources from the 15th, 16th and 17th centuries have been found and related to the history of the monastery. The southern nave, which is dedicated to St Antonios, can clearly be identified as the older part of the church. The small size of this nave and the autonomous composition of the frescoes here suggest that it was erected as a private chapel and burial place. An examination of the iconography, style and the contents of the murals permits a precise dating of the frescoes between 1420 and 1430. Further investigation on other aspects of the last cultural flowering of Byzantium in Venetian Crete demonstrates a complex interaction between traditional Byzantine art and the Renaissance in the West. Special attention has been given on the Emmaus scene, an innovative depiction that may be regarded as a model of its kind. The master of Brontisi clings almost stubbornly to the traditional formal language of the 14th century and its principal manifestation in Constantinople, namely the Chora church. On the other hand, his tendency to create strikingly independent figural compositions of great spatial presence, while at the same time breaking up the painting’s tectonic background, signals a move towards an ongoing stylistic development. Despite the stylistic similarities to other fresco cycles painted within a short period on Crete, the unknown artist was concerned above all with an innovative approach. He sought to articulate religious precepts through new compositional techniques; his ability and his training, which he received in all likelihood in Constantinople, allowed him to absorb into his own style the new impulses that reached this Mediterranean island in the early 15th Century. Contents: Vorwort. 1. Einleitung. 2. Das Monument und sein Geschichte. 3. Die Fresken im Südschiff (3.1. Das Bildprogramm in Umrissen. 3.2. Überlegungen zum Bildprogramm. 3.3. Ikonographie – Ikonologie). 4. Stil und Qualität der Malereien (Das Werk des Meisters von Brontisi in Vergleich mit zeitgenössischen Freskenzyklen). 5. Zusammenfassung. 6. Synopsis (Art on Late Palaiologan Crete). 7. Anhang (7.1 Übersichtstafel, 7.2. Monasterium Sanctae Catherinae in Monte Sina, HS. Gr. 482. 7.3. Archivio Segreto Vaticano, Armarium XXXIV, Vol. 6. 7.4. Oxford, Bodleian Library, MS. Holkham 7. 7.5 Oxford, Bodleian Library, MS. Canon. 2). Register, Abkürzungen – Literatur. Verzeichnis der Abbildungen. 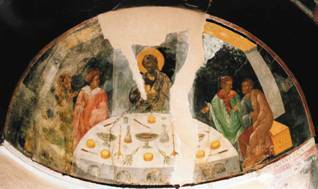 The Supper at Emmaus, St. Antonios, Brontisi Monastery, 1420-1430 A.D.